This interview took place on: November 8, 2016. JFH (Bert Gangl): Jon, let me start off by saying that I've listened to quite a few debut Christian albums by mainstream artists and your new record is, by far, one of the strongest I've heard. JFH (Bert): So, we've all heard stories of artists who claim that they were composing their own songs, singing on-key and putting their first band together before they learned to chew solid food. How about yourself? Were you exposed to music at a young age? Jonathan: I was. When I was a kid growing up in the fifties, my father recognized that I had an ear for music. I could sing any song on the Billboard Hit Parade. Believe it or not, though, my first real taste of music came through Gregorian chants. We had a boys group that would sing the chants an octave higher than they were written. It was wonderful. We had a Gothic church where all this Latin music just flowed. It was just real, true worship. I had a love of Jesus Christ very early. My father was a very spiritual man who taught me to pray by the time I was seven. I felt like I had a real connection to Jesus at that time. In fact, I told my parents that I was going to be a priest. JFH (Bert): Wow! Along those lines, you were involved in the 1958 fire at Our Lady of the Angels Catholic School in your hometown of Chicago. Jonathan: The parish we were involved with had a Catholic school next door, and I started attending the school. Then, we had an awful fire there on December 1, 1958, where we lost 92 children and three nuns. I was only eight years old and my faith was shaken. I felt that my Jesus might have abandoned me. Where was he? I had questions. My father saw this and he said to me, "Son, you were saved from that fire to do great things. I'm going to give you music lessons." So, he took me by the hand to the local music store. I was a little kid and the only thing I could play was an accordion. So, he put the accordion in my hand and I started playing Italian songs -- every Italian song ever written. Jonathan: My first concert, when I was eight years old, was for a bunch of Italians in the downstairs part of a delicatessen. People in the audience were crying and singing and having these flashbacks to their childhood, and I looked at my father and said, "I changed my mind about the priest thing. I think I want to be a musician!" So, my father started telling people that I was going to be a famous songwriter and play for 10,000 people a night. I'm only ten years old at this time. JFH (Bert): That's pretty strong medicine for a ten-year old. After high school, I understand you enrolled at a music conservatory. Was this a classical music school? Jonathan: It was. The Chicago Conservatory of Music at Roosevelt University. I studied composition, theory, voice and piano. My father told me I was going to be a writer, so I took him seriously. JFH (Bert): Getting to your professional career; some of our younger readers might not be familiar with your early years as a major-label artist. You released a solo album in 1977 and, by 1979, you'd replaced keyboardist/guitarist Michael Corby in the UK rock group, The Babys. How did a guy from Chicago join up with a band full of Brits? Jonathan: I was in L.A. at the time. I'd quit playing clubs and was concentrating on songwriting, and an English friend of mine, Robbie Patton, who I was writing with at the time, dared me to go to the auditions at S.I.R. Studios on Sunset Boulevard. I think I ended up going about four times. It took them a month to finally choose somebody. JFH (Bert): Your first album with The Babys, Union Jacks, came out in January of 1980 and by the first full week of spring that year, your band was opening concerts for none other than Journey. That must have been huge. Are there any moments on that tour that stand out for you? Jonathan: Yeah. Playing at Madison Square Garden and at the L. A. Coliseum for 100,000 people. JFH (Bert): I can imagine what a thrill that must have been. Did you talk to your father after that and say, "Hey, Dad, you were right!"? Jonathan: I did. But, even then he said, "This Babys thing is just a stepping stone to the next big thing, Jon." He was convinced that there was something even bigger that God had for me. As it turns out (then-current Journey keyboardist) Gregg Rolie was going to retire and Journey was looking for a new sound. So, I got a phone call from them in the summer of 1980 and they said, "You're coming up here, and you're going to help us make this new album." And, so, I did. JFH (Bert): And, the sound did change drastically on that record. I was a fan before then. I came on board with the Evolution album. And, I remember thinking to myself, when I heard the Escape release, "Man, this is something completely different!" The Babys were an amazing live act, your albums were superb, and yet you guys never really gained any lasting widespread commercial success. When the Journey Escape album goes platinum less than two months after being released, I would imagine that would have to have been at least some sort of artistic vindication for you. Jonathan: It definitely was. They wanted a new sound, and they trusted me to help craft that, and that's what we did. The five of us really got it together on that record. JFH (Bert): Fast forward six years, and Journey is just entering what would become a decade-long hiatus. I know you joined up with ex-Babys lead singer, John Waite, along with some of your former and future Journey band mates, to form the hard rock band, Bad English. What did you do between the time of that group's breakup in 1991 and the reformation of Journey in 1996? Jonathan: I made my second solo album, Back to the Innocence in 1995. Around that time, I was wondering to myself whether or not the guy who wrote (the Top 20 Journey hit) "Faithfully" was still around. I had a sort of minor hit with "I Wish That I Was There with You," which I wrote with John Waite. The song went Top Ten in Tampa, so I'm down in Tampa doing a radio show and I get a call from Steve Perry asking me if I wanted to do another stint with Journey. It was fantastic. We got together in 1995 and wrote 15 great new songs for the Trial by Fire album. JFH (Bert): Fast forward again, twenty years this time, from 1996 to the present day. Journey is still touring and the band is still very much a going concern. What did the guys in the group say when you told them you were working on a Christian album? Jonathan: I think they were happy for me. They knew that I had restored my walk with God, through my association with Paula (White, Cain's wife and pastor of New Destiny Christian Center church in Orlando). I'm around the word so much now, it just seeps in. Because of that, I was inspired as a writer, and that's what lead me to this sort of music. JFH (Bert): A co-worker of mine informs me that (former Journey drummer) Deen Castronovo plays and sings on the new album. Jonathan: That's right. I called him around the time that I started leading praise and worship at New Destiny. He'd left Journey and I knew that he needed to return to his purpose again. He'd gone through some really rough times and he was just sitting at home, so I rang him up and said, "God told me to call you. Would you help me with this album?" And he did. It was just a natural thing and it was pretty mighty. He'll be my first call when I put my band together. His faith was very strong when I was in Bad English. He would show me scriptures and I was kind of jealous of where he had come to in his relationship with God. I'm just so amazed at how far he's come as a Christian. JFH (Bert): As a married believer, I often wonder how artists like yourself -- who have a full slate of writing, recording, touring and doing interviews like these -- find time to nurture your relationship with both God and your spouse. Jonathan: Well, it's a natural thing with Paula. We have a deal where we travel together, so I'm on the road with her and there's always scripture there. And I feel like my songwriting is sort of an act of worship for me. The more I write, the more I feel like I'm where I'm supposed to be in my ministry. And we always have time together in church. When she's preaching, I'm listening, and when she's praying, I'm playing keyboards behind her. And I sometimes play a song or two. JFH (Bert): That's wonderful. Are there any plans to tour solo behind your new release? Jonathan: You know, it's hard to do that with only one album. I'm going to have to let this log burn on the fire for a bit. That said, I have some offers coming up for the spring. So, if we can string six to twelve shows together, we will do that. JFH (Bert): That's excellent. Jon, I cannot tell you how much I appreciate you taking the time to talk with me. What a huge thrill this is for me as a Journey fan, and a Baby's fan as well. Jonathan: Thank you so much, Bert, for having me. You'll be hearing more from me. I've got more music coming. JFH (Bert): That sounds great, Jon. Thank you so much! 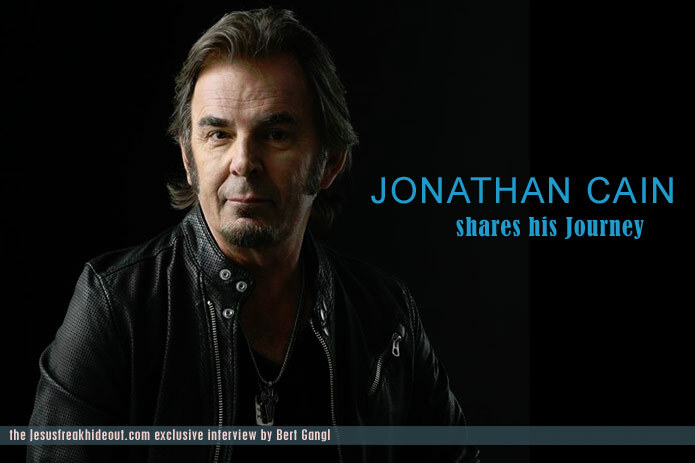 Jonathan Cain's latest album, What God Wants To Hear is available now wherever music is sold!